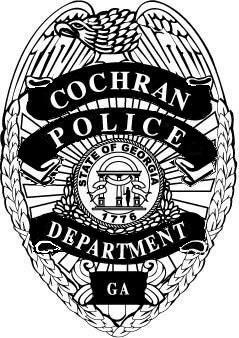 The City of Cochran Police Department, serving a daytime population of approximately 7,500 people, is a full service law enforcement agency dedicated to preserving life, protecting property, and maintaining order. By implementing these principles within a community based policing model, our dedicated professionals are committed to creating a higher quality of life for the residents and visitors of our city. We accomplish these objectives by providing the highest level of customer service in the most effective and efficient way possible through the performance of our duties. It is the mission of the Cochran Police Department to assure that our community is safe from crime and disorder by focusing on the prevention of crime along with reducing the fear of crime. We believe in treating all people with dignity and respect, including showing compassion and concern for the victims of crime along with treating offenders with fairness. It is through our respect for people that we gain respect for our department and the law. We strive to provide the highest level of service to our community. We value the diversity and work in partnership with all segments of our community to achieve our mission of reducing both crime and the fear of crime. We are members of an honorable profession and should always conduct ourselves in a manner that earns respect from all people. Our actions will be governed by the principles set forth by the Police Officers Code of Conduct, United States Constitution, and the Law. It is our goal to achieve excellence in every aspect of what we do. We demand the highest standards for ourselves and are never satisfied with the "status quo". We embrace change and continuously seek out new ideas, both from within the department and from the community, to improve our performance.